Sales on Google Play Gift Cards have been few and far between since their launch in Australia in August 2013, but if you’ve been saving your money to get a discount then now’s your time, with Woolworths offering 10% off Google Play Gift Cards in their latest catalogue. The offer appears in the current catalogue (page 31) which begins today and runs through until next Tuesday, the 2nd of February, there’s no jumping through hoops to get them, it’s just a straight 10% off – though you can only get them in-store with no option to buy online. Of course you can get better deals using things like Telstra credit and Carrier billing, but that’s a pain in the proverbial, so for a straight 10% off Google Play Gift Cards, this is a pretty good deal. Finally! 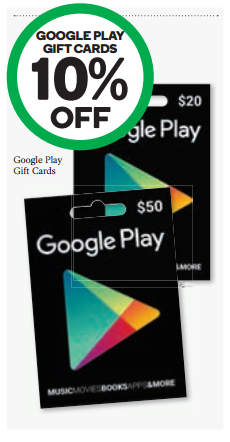 It seems like the supermarkets have the “other” store’s gift cards on sale every other week but Play Store discounts are like the proverbial rocking horse ……. I’ll be picking some up. 5% off, 5% off plus this 10% off. NICE!